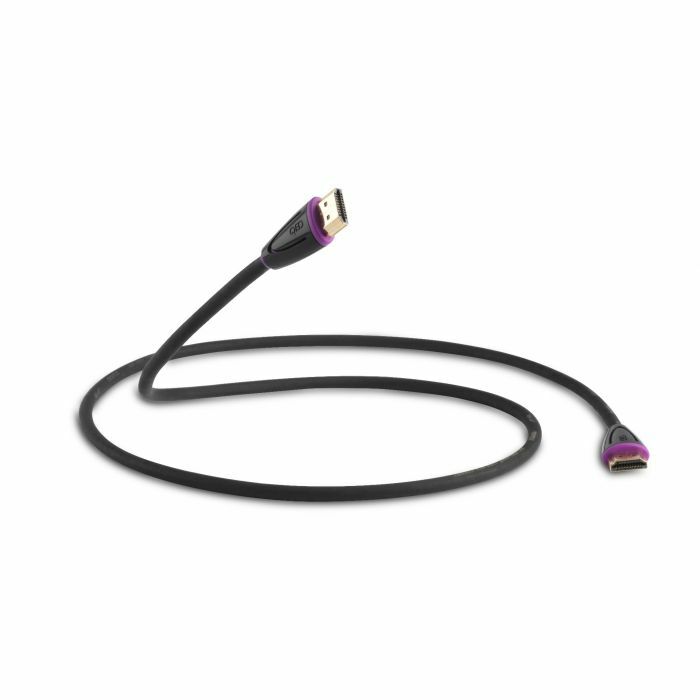 QED's multi-award winning Profile HDMI cable just got better. The class leading compact HDMI cable which won the Product of the Year Award 2010 in What Hi-fi? has been constantly developing since - with all lengths being designated Deep Colour capable in 2011 and the HDMI Ethernet and Audio Return channel added in 2012. Now QED have added an eFlex(TM) jacket and a miniature plug to the already versatile design so that the cordage is at once more pleasing to handle and even better at fitting into those confined spaces behind wall mounted large flat screens. At QED, we offer a lifetime guarantee on all our cable products. Profile eFlex HDMI measures at less than 70ps of jitter to deliver accurate timing of video and audio data. With an all new miniature plug body design, the minimum clearance required for this cable is now a tiny 40 mm which means it will disappear completely behind any wall mounted or free standing display. QED is the only UK manufacturer able to test HDMI cable designs beyond the scope of the current HDMI specification, which means it is uniquely placed to evaluate new technical innovations before deciding whether or not to introduce them into full production. QED has identified cable induced timing error, termed 'jitter', as one of the key differentiators between satisfactory and outstanding cables. Because QED customers demand better, we have scientifically designed our cables to reduce jitter to the absolute minimum. The new Profile eFlex™ HDMI uses a new PVC variant dubbed 'Ultra Matte' which takes advantage of recent advances in plasticizer technology to produce our most flexible HDMI jacket material yet. With an all new miniature plug body design, the minimum clearance required for this cable is now a tiny 40 mm which means it can be completely hidden behind any wall mounted or free standing display. New desirable design, improved flexibility, smaller head shell and now High Speed up to and including 3m! Profile retains the QED quality control and attention to detail that so impressed What Hi-fi? all those years ago - this means that the cable we designed, prototyped and measured is the same one that you can buy in the shops time after time. Using our state of the art HDMI test suite we can test and measure each new batch of cables so that, unlike some other manufacturers, we aren't reliant on the variable quality of cordage on the world market at any particular time. This is why each cable sold comes with a QED Lifetime Guarantee.